Arcade Basketball Game - M01462W Harvard Deluxe Double Shootout Electronic Basketball Game. 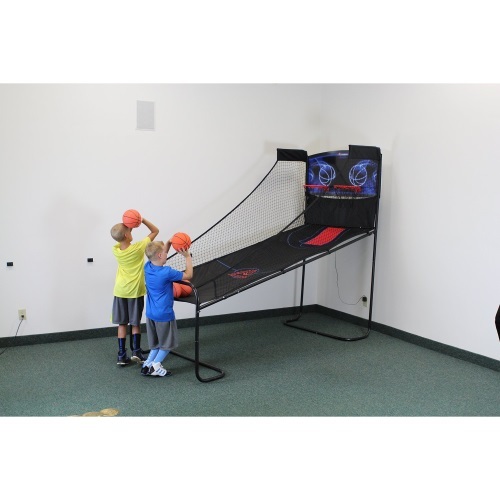 Free shipping for this arcade basketball game when shipped to the lower 48 United States. 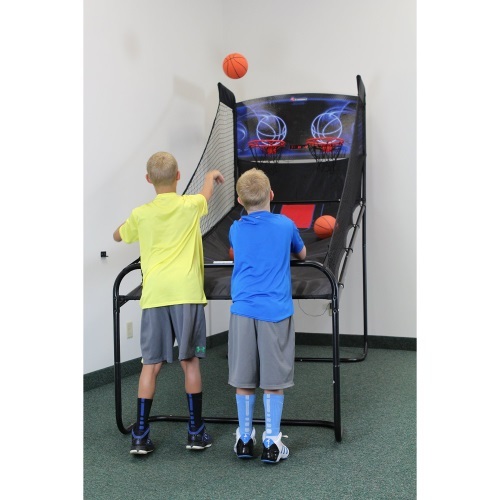 Deluxe Harvard double shootout arcade basketball game features a strong steel frame, two basketball hoops, and an electronic scoreboard. Play a solo game to beat your best score, or go head-to-head with a friend. 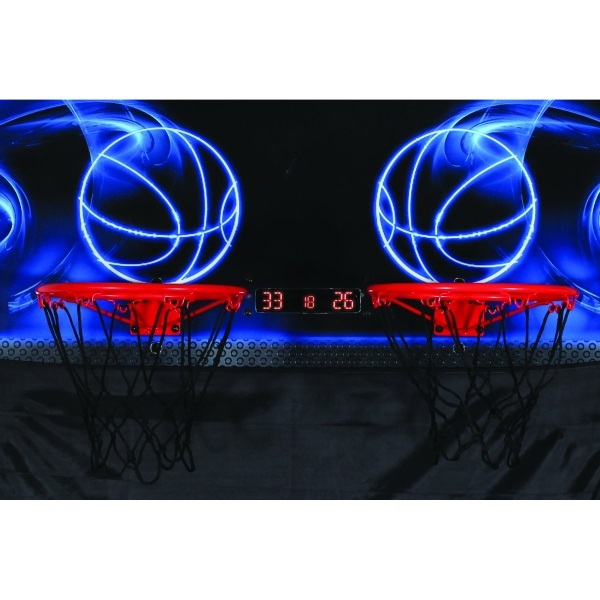 Each basketball goal uses an infrared sensor to help track scores accurately. 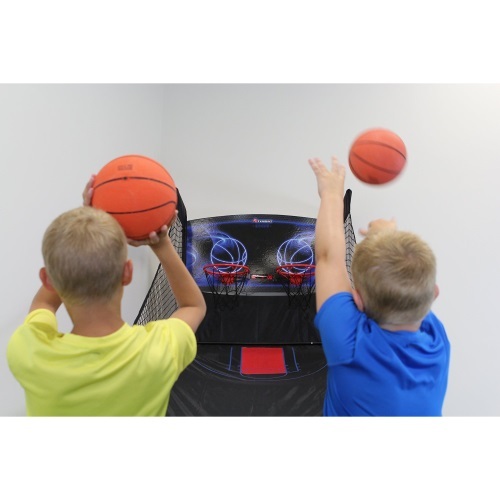 Order your arcade basketball hoops here. Two hoops for solo play or head-to-head competition. Electronic scoreboard and play clock. Steel body uses 1 1/4" steel tubing. Comes with 4 mini balls. Includes air pump and needles. Shipping package dimensions: 46" x 25" x 3.5"
Assembled weight: about 50 lbs. Assembled dimensions: 106 inches L x 45 inches W x 89 inches H.
Typically ships via FedEx. Orders generally leave the warehouse within 2 business days and then spend about 3-6 business days in transit. Warehouse located in Evansville, Indiana. What is the difference between the Deluxe Harvard Double Shootout Basketball Game, model M01462W, and the Regular Harvard Double Shootout Basketball Game, model M01609W? The M01609W Harvard double shootout basketball game uses a crisscrossing play style and if foldable. 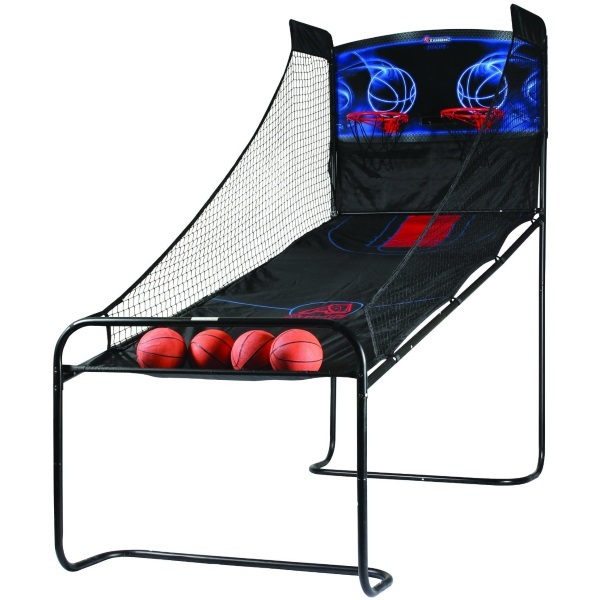 The M01462W Harvard Deluxe double shot basketball game uses a typical playing design and does not fold. This unit is called Deluxe because its steel tubing is larger and provides a more sturdy design than the M01609W. Not bad. Checked this out as a display and it plays well. Looks pretty sweet too with the court graphics on the ramp. Q: Can this be used by Adults? A: From experience we have found that this is great for both adults and kids alike. Q: Does this product work in a room with 8 foot ceilings? A: Yes, it does. The tallest height is 79 inches high. Q: Is this sturdy enough for adults and children to play alike? Or is it just children? A: It is definitely designed for both children and adults. This is great for break rooms in the office or for game rooms at home. Dimensions: 46" x 25" x 4"